Flexible Oval Steel Conduit(F2012) - Bliss Yih Enterprise Co., Ltd. It is important to put all wire and cable in order and keep a safe power supply with various electrical appliances and facilities in office. For better arrangement of wires among office furniture, BLISS presents new flexible oval steel conduit! The space among office furniture, such as floor, partition and ceriling, is usually square and narrow, the shape and perfect U bend of BLISS flexible oval conduit enlarges the utilization of the space, and provides better and safer wire management. 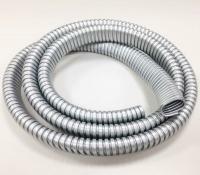 F2012 Flexible Oval Steel Conduit is used for wire harnesses within or for connecting parts of an appliance and similar applications, normally for office furniture, wire stations, and partitions. 2. Hot dip galvanized steel and zinc plated. 3. Extremely small bending radius. 4. RoHS and REACH compliant. 6. Made in accordance with UL1286 & UL183. 7. Custom specification is available by request.